Some common sign to tell if a cat is infested with fleas include restlessness, frequent itching and chewing of the skin. Being able to identify and provide the best flea treatment for your cat would go a long way to eliminating fleas from your cat. Be on the look-out for any form of movement on your cat’s fur. If you notice tiny bugs coming off her furs. Then there is every possibility your cat might be infested. Use a flea comb to comb your cat. If there are fleas on your cat, the cat fleas and flea eggs will fall off her body. Remember to dip your comb in soapy water to kill the cat fleas found on your cat. A flea collar that contains both imidacloprid (Seresto) and flumethrin can function properly as a flea barrier. 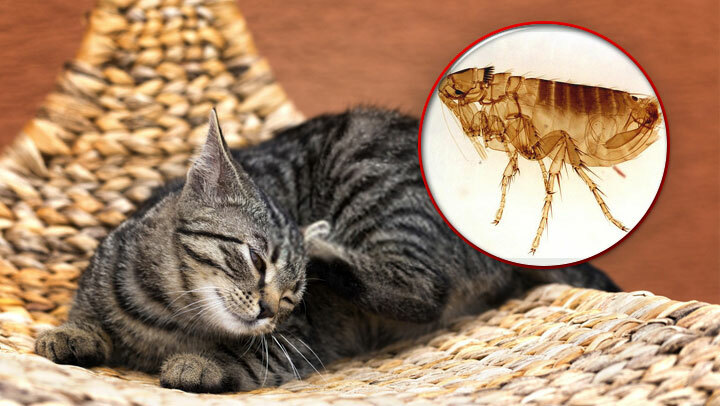 Cat flea medicines like Nitenpyram (Capstar) which is usually consumed by a cat can kill adult fleas in about 30minutes after consumption without any known side effects. Spinosad (Comfortis) offers 30-day flea protection to help stop the future spread of fleas. This is mainly because it kills the fleas before they begin to produce eggs. Thorough house cleaning and vacuuming is one of the tried and tested home remedies for fleas on cats. Ensure you vacuum your home every day, from your carpet to furniture with cushions down to crevices and cracks found on the floors to take up any egg before they hatch. Vacuuming can also help to eliminate adult cat fleas. It is also important that you remember to dispose of the vacuum’s bag properly and thoroughly wash the container with warm water and detergent when you are done. In addition to vacuuming daily, ensure you wash your bedspreads, sofa and other fabrics daily immediately they have contact with your cat. Also, ensure you wash with warm water. Vacate your house, ensure that all inhabitants are taken out of the house, once this has been accomplished, then coat the entire surface in your house with a flea spray. The recommended flea sprays are the ones that contain either pyriproxyfen or methoprene. If you are sceptical about using chemical substances at homey, you could try using a citrus spray. Ensure your house is completely vacant until all surfaces are completely dry. Ensure all your pets that is if you have more than one are treated for fleas. Employ the service of a flea professional to help deal with the issue. Dealing with fleas isn’t difficult as they are quite easy to exterminate irrespective of their quantity. Using the methods listed above should get you free from fleas in no time.